Here’s why the Feds called BS on Santa Monica’s airport business evictions. Santa Monica Municipal is a historically significant and busy little single-strip city airport, but if the City of Santa Monica had its way, the facility would be a ghost town already. The city officially says it’ll be a park, but there’s good reason to suspect the real motive is not green but greed, as in the prime SoCal beachside real estate variety. Good thing the FAA has for decades been fighting the City’s plans to close the airport. On Tuesday, it got nasty. Here’s what happened and what it means. 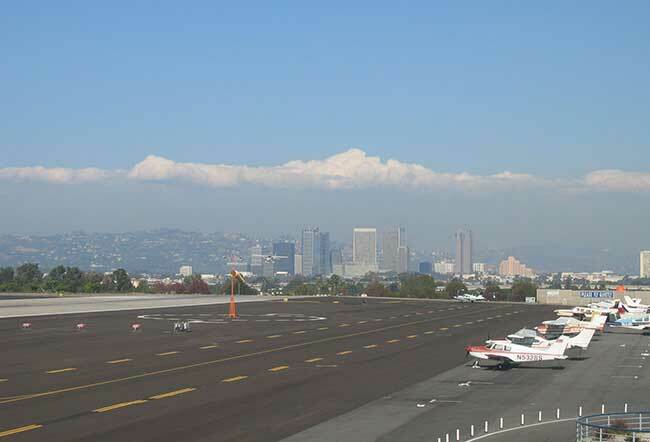 There are 267 airplanes based at Santa Monica airport and every day around 450 airplanes use the airport’s one runway for the purpose of business, personal or flight training uses. For decades the City has been trying to close the airport and the FAA has been working to keep it open. When Mayor Richard M. Daley of the City of Chicago decided to close its lakefront airport, Meigs, it started by working with the FAA to figure out a way to do that. When it failed in its efforts, the mayor did the unthinkable and on March 30, 2003, ordered work crews to demolish the runway. That was it for Meigs. After long, tense negotiations with the FAA, which is requiring Santa Monica to keep the airport open as part of its grant obligations, the City of Santa Monica decided to try a different tactic, starving the airport of services. Earlier this year, it evicted lone FBO Atlantic Aviation and flight school American Flyers from the airport so it could, it claimed, provide those services itself. No on believed the move was anything but part of the City’s plan to shutter SMO, and the City wasn’t even trying very hard to make the ruse look plausible. That’s the issue the FAA jumped on, that the city’s claim that it was evicting its clients from the airport wasn’t believable because the City hadn’t done much to establish fuel sales and flight training at the airport itself—not that a municipality providing flight training is a believable option to begin with. Last Tuesday the FAA got a court order preventing Santa Monica from evicting its tenants, which was supposed to have happened by now, as it fights in court to keep Santa Monica from closing SMO. The FAA’s effort might work for a while, but it’s hard to believe that even if the starvation strategy is ruled illegal the City won’t just come up with another plan to get its way. We only hope it doesn’t involve bulldozers at midnight. It couldn’t the FAA if the city bulldozers the runway, sue it for vandalism? After all it would be illegal I think. This nonsense has to be stopped, once and for all. The city needs to be held to its agreement to operate the airport “in perpetuity,” and the airport needs to be restored to its original footprint per this original agreement. Perhaps one means of doing this would be suits against those who are precipitating these actions. The city, and those who are bringing about these actions, should be held responsible for legal fees and damages.